Calling all heathens. You know who you are. We are about to have a biblical lesson. Not a Bible lesson exactly but I want to talk about fish. And listening to your mother, because she is probably right. Who remembers when we didn’t know what tilapia was? Never heard of it and then, seemingly, it was ubiquitous. On every fishy crushed ice spread in every grocery store. And bags and bags of frozen filets in the freezer section as well. When tilapia first came to my attention, my mother and I were discussing it and she told me that tilapia was most likely the fish that the apostles were catching in Sea of Galilee. How does she know these things? She goes to church, people. And apparently pays attention during the sermon. After just a little research, I discovered she was so right! In fact, in many regions, they call tilapia St. Peter’s fish. I think that is kind of cool. This dish is one of my summer favorites because my sister, Marta, always makes it when we are home for the long school break. Upon finding lovely fresh tilapia filets in my local Carrefour supermarket, I wrote and asked her for the recipe. Her instructions included the method and the ingredients but no amounts so I will try to quantify it for you. But I imagine if you put a little more of this, or a little less of that, this will still be just as delicious. I am pretty sure I put way more mushrooms than she would but they looked lovely and fresh that day. Optional: flat egg noodles to serve this over. Rinse the tilapia to make sure all the scales are gone. I also tidy up the margins with a sharp knife because I am like that about fish. You don’t have to. Give the filets a good sprinkling of sea salt and a couple of good grinds of fresh black pepper. Clean and slice your mushrooms and squeeze your lemons, if you are using fresh juice, which I highly recommend. Drain your artichokes. I had jars of the tiny ones so I didn’t cut them but you can half or quarter larger ones if you’d like. Melt your butter in a large saucepan, preferably non-stick and add a drizzle of olive oil to keep it from burning. Gently cook the fish in the butter, for a few minutes on each side. No one said this was a diet dish. Remove the filets to a plate when just cooked through and cover them. Tip your mushrooms and artichokes into the saucepan and sauté until the mushrooms have given up most of their moisture, stirring occasionally. I put the lid on and turned the fire down because I wasn’t in any hurry but this shouldn’t take more than about 5-7 minutes. Add in the lemon juice, white wine and whipping cream. Give it a good stir and lower the flame to a simmer. Cook until it thickens slightly, stirring occasionally. Slide the fish back into the sauce, making sure to add back all the juices that have accumulated on the plate as well, and carefully redistribute the filets around the pan. Heat gently until the fish is warmed through and then serve. I was serving this for a dinner guest so I put the noodles in a dish, added the tilapia and ladled the sauce over the whole thing. It occurred to me afterwards that a light sprinkling of chopped parsley would have looked pretty but never mind. The dish tasted delicious. Kind of a stroganoff of tilapia, if that makes any sense to you. Give each person a healthy serving of noodles, topped with mushrooms and artichokes and one filet. My goodness! Great food and a church lesson all in one! now I don't have to go to church on Sunday! hahaha!! This looks so good and I just love ALL those things. Are the little green things zucchini? Or, little pickles? I am not much of a church-goer myself, but I do attend a ladies Bible study once a week. I much prefer the academic nature and fellowship of that. The little green things are baby zucchini. Aren't they adorable? omg I wish I could make this tonight. Getting the taste for your tilapia. what tease! It is one of my favorite dishes, Helene! I hope you give it a try. 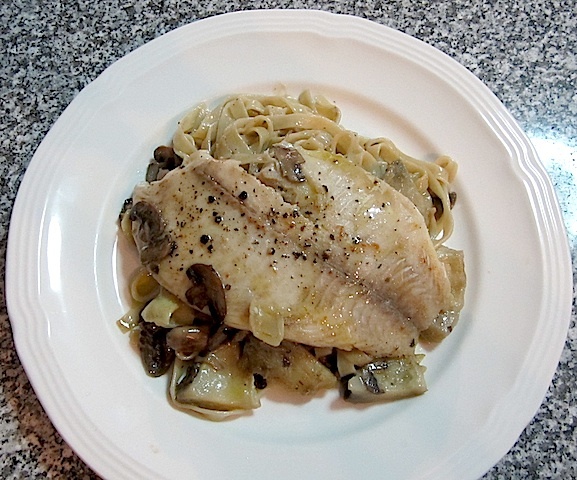 Mmm...tilapia strogonoff - this is brilliant! The amount of cream looks just about right to me, Stacy! I hope you and your mom are having a fabulous holiday. I knew I liked you, Nancy! It really was the perfect amount of cream. We did indeed have a fabulous holiday. I am sitting in the airport in Amman, Jordan, on my way back to Dubai now though. As much as i enjoyed the tour, I will also be very glad to be home and in the kitchen again. I am thinking pork chops for dinner. Aren't you sweet? You thought I meant I went every week! :) I love that picture of you in the Dead Sea!! it's adorable! Yum! I live tilapia and this looks like a great way to prepare it - definitely going to try this one!